Lingonberry is really a gift to the whole world from Scandinavia. That’s right! The lingonberry, which is also known by names such as cowberry, foxberry, mountain berry, and rock berry, first originated in Scandinavian countries like Sweden, Norway, Denmark, Finland, and Iceland. Lingonberries are the Scandinavian answer to American wild blackberries. The scientific name of lingonberries is Vaccinium vitis-idaea, and they grow in great numbers on low-lying evergreen bushes all across Scandinavia and in forests in Canada and the New England states. The lingonberry plant is typically between one and one-and-a-half feet tall and has clusters of small and pinkish flowers at the tips of one-year-old growth. Lingonberries are a vibrant red in color and usually bloom in May and ripen in July. A second crop typically matures in October and produces a healthier, larger fruit because of the cooler weather. Lingonberries have been harvested in Scandinavia for centuries and have been traded for profit by farmers since as early as 1732. Once the railway system was developed, it became possible for the lingonberries to be exported to other countries. In 1902, for example, Sweden was able to export as much as 44 million pounds of lingonberries. What Does Lingonberry Taste Like? Lingonberries have an alluring bright-red color that makes you want to pluck them from their plants, but they don’t taste so well when eaten raw. In fact, they taste quite sour and tart. But with just a little sugar, you can turn the berries into an edible and tasty syrup or preserve that can be eaten with a variety of desserts and animal meats like beef, lamb, and fish. Lingonberries lack the size of the cranberry, but they’re much juicier than their tangy relative. Structurally, they’re closer to the raspberry, though with a bitter taste. Lingonberries are not so easily available, but they’re no different from more familiar and popular berries like cranberries when it comes to their selection and storage. First, just toss out all the soft and mushy or discolored berries. Wash the remaining healthy berries thoroughly. Always store the lingonberries and their products in your refrigerator. You don’t have to worry because lingonberries contain high levels of the natural preservative benzoic acid; they’re safe to eat as long as they are refrigerated. Lingonberry jam and juice are gaining popularity in the United States and can be found on shelves of more and more grocery stores, although fresh lingonberries are harder to find. Lingonberries contain 84 calories and almost no saturated fat, which is good news for your body. They do have small amounts of polyunsaturated and monounsaturated fats, carbohydrates (mainly sugars), and vitamins A and C. They do not have much in the way of minerals except for calcium and iron, which are very beneficial to your health. The cranberry is well known for its UTI-blocking ability, and this property may extend to its cousin, the lingonberry. In 2001, the British Medical Journal published a study in which researchers found that people who were given a mix of lingonberry and cranberry juice had fewer recurrences of urinary tract infections. However, the jury is still out on whether lingonberry can fight a UTI all on its own without the help of cranberry. In a 2003 study, 40 healthy men (all 60-year-olds) were examined to find out the effects of lingonberries, bilberries, and black currants on their blood quercetin levels. Half of the participants consumed 100 grams a day of these berries for eight weeks. The remaining 20 people consumed a regular diet. The results were published in the European Journal of Clinical Nutrition and showed that people who consumed the berries had a measurably larger amount of quercetin in their blood. Considering that quercetin has anti-inflammation abilities, it may benefit people who suffer from chronic inflammation diseases like arthritis. Most oral diseases are caused by a harmful bacteria imbalance in your mouth. A low-sugar, anti-inflammatory, and antibacterial diet can help you combat this problem. According to a 2001 study, published in the Journal of Pharmacy and Pharmacology, lingonberries contain catechins that could work powerfully against two bacteria that cause gum and mouth disease (P. gingivalis and P. intermedia). Oral infections can lead to several more dangerous diseases, so make sure that your mouth is always clean and healthy. Lingonberries contain a fair amount of vitamin C, so consuming them could potentially help boost your white blood cell count. This increase can protect your body from infectious microorganisms. Lingonberries, like most berries, contain flavonoids called procyanidins, which may help protect your body from several types of cancers such as leukemia, cervical, and colonic cancer. They are known for their ability to inhibit cancer cell growth and are thought to specifically give the lingonberries their power to fight cancer. It is the most common form of lingonberry consumption and spreading it on pancakes gives the breakfast staples a delicious flavor. It is most commonly used to sweeten red meats like lamb and pork. You can extract juice from lingonberries and drink it. Be warned that the resulting beverage will be quite bitter and sour. It goes very well with your morning smoothie, so drop a few lingonberries in it. The simplest way to consume the berries is just to eat them fresh, but keep in mind that you may not like their mouth-puckering taste. Fill a large pot with water, put the lingonberries in, and bring to a boil. Boil for five to 10 minutes and remove any foam from the surface. Put in the sugar and bring to a fast boil. Then continue boiling for a few more minutes. Spoon the jam into clean, disinfected jars, but leave 1/4 inch of headspace. Cover the jars with their lids and screw on the rings. Process them in a hot water bath for around 10 minutes for them to seal. You can refrigerate the lingonberry jam once the jar has been opened. Put all the ingredients into a large skillet and heat on medium to low. Bring it to a simmer and occasionally stir for about 25 minutes. Once it starts to simmer, cook it until it is slightly thick, for about 10 minutes. Continue stirring occasionally. Let it cool completely, and remove the allspice, cinnamon, and thyme. Your lingonberry sauce is ready to serve now. If you want lingonberries or lingonberry jam, your best bet is to try an ethnic (preferably European) supermarket. You may also find frozen and canned lingonberries in specialty health food stores. They are sold as red whortleberries, mountain cranberries, cowberries, and mountain bilberries. Unfortunately, it is almost impossible to find fresh lingonberries unless you buy them online or pick them from the bushes yourself. Lingonberry, or Vaccinium vitis-idaea, originated in the Scandinavian country of Sweden. It’s also found root in other European countries like Norway, Finland, Denmark, and Iceland, and was easy to spot and pick because of the bright-red color of its berries. International availability of lingonberry happened when the railway system was developed, but farmers in Scandinavian countries were trading the fruits from 1732 A.D. onwards. Despite their tart and sour taste, lingonberries offer several potential health benefits, such as anti-inflammatory properties, reducing urinary tract infections, maintaining oral health, improving the immune system, and reducing the risk of cancer. You can use lingonberries to make some really tasty dishes such as lingonberry jam and lingonberry sauce. It’s a bit hard to find lingonberries, but if you manage to get your hands on them, you’ll find that they delight your taste buds as well as those of your family and friends in sweet and savory dishes. It’s the perfect opportunity to jam with them! https://foodfacts.mercola.com/lingonberry.html, last accessed December 10, 2018.
https://www.thespruceeats.com/what-are-lingonberries-2952920, last accessed December 10, 2018.
https://healthyfocus.org/6-proven-health-benefits-of-lingonberries/ last accessed December 10, 2018. 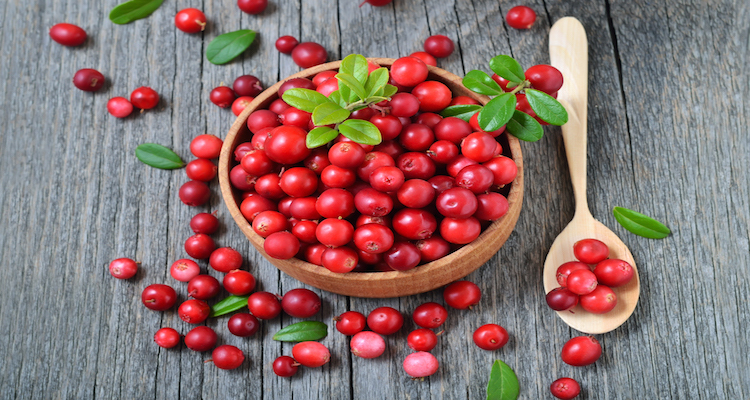 “Lingonberries,” nutritionix, https://www.nutritionix.com/food/lingonberries, last accessed December 10, 2018. Kontiokari, T., et al., “Randomised trial of cranberry-lingonberry juice and Lactobacillus GG drink for the prevention of urinary tract infections in women,” British Medical Journal, June 2001; 322(7302):1571; https://www.ncbi.nlm.nih.gov/pubmed/11431298, last accessed December 10, 2018.
https://www.healwithfood.org/health-benefits/lingonberries-cowberries-medicinal-juice.php, last accessed December 10, 2018.
https://draxe.com/lingonberry/, last accessed December 10, 2018.
https://www.ncbi.nlm.nih.gov/pubmed/12548295, last accessed December 10, 2018. Ho, K.Y., et al., “Antimicrobial activity of tannin components from Vaccinium vitis‐idaea L.,” Journal of Pharmacy and Pharmacology, Feb. 2001; 53(2):187-91; https://doi.org/10.1211/0022357011775389, last accessed December 10, 2018.
https://www.organicfacts.net/lingonberry.html, last accessed December 10, 2018.
https://www.allrecipes.com/recipe/55220/lingonberry-jam/, last accessed December 10, 2018.
https://www.tastingtable.com/cook/recipes/lingonberry-sauce-recipe, last accessed December 10, 2018.